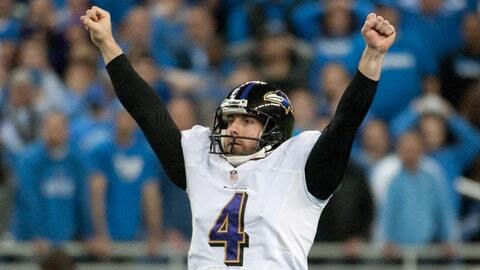 Justin Tucker became a hero overnight as his six field goals, including a 61-yarder in the final minute, gave the Ravens a huge 18-16 win over the Lions in Detroit on Monday night. On Tuesday, his name was all over billboards in Baltimore, with the message taking a shot at Lions WR Calvin Johnson, aka Megatron, who had a few key drops in the loss. Clear Channel Outdoor posted the messages this morning to the electronic billboards they own. There’s just one problem. The "Legatron" nickname belongs to St. Louis Rams kicker, Greg Zuerlein. Appreciate all the kind words and the idea of a nickname, but 'Legatron' has alrdy been earned by another quality PK, Greg Z..Open to ideas!